Montenegro tempted me since last year. Even going on common holiday with "all inclusive" I usually rented a car and visited the local area. 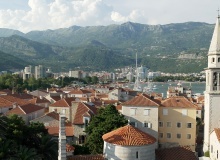 Everyone who was in Montenegro were delighted with it. Such beautiful scenery, such nice people, such good food, such beautiful landscapes and such beautiful landscapes. Especially by the beautiful landscapes I must be there. Is Montenegro is safe? This is the question that friends asked me as the first question about my journey. 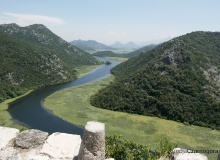 Because sometimes people doesn't know where and what is Montenegro. One of my interlocutors, when I answered the question where I go on vacation, he asked directly: "where is it?". But then I go where, I could eat where I want (as I always I dreamed: lying on the beach, and when I get hungry, just going to the beach restaurant, sit at a table overlooking the sea and order whatever I want. Such a small definition of freedom. News - new articles, news photos, etc. Rijeka Crnojevića - very famous attraction of the photographs. But also a place which looks very few tourists. This place is close to the main road, but far enough away that someone wanted to go there. A very, very, very worth it. I've added a description of well-known attractions (ie such where there are tourists, is described in the guide). The first such attraction is Mausoleum Niegosza, ruler of Montenegro from the nineteenth century, located at the top Jezerskego Vrh in the National Park Lovcen - very close to the wybrzerza. 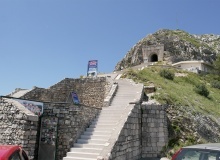 Up of the mausoleum can be seen from almost anywhere in Montenegro.